Pond located at trailhead. Note the paved trail. Comments: This new park is a joint venture of TPW and the city of Mineola. They have done a nice job. 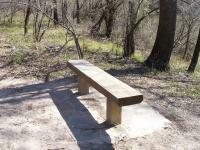 The trailhead facilities include great views along "wildlife viewing corridors" and well-maintained restroom facilities. The first quarter mile of the trail is paved (no bicyles or motorized vehicles allowed). The majority of the trail is an old railroad bed through a wetland north of the Sabine River. It is an easy hike, and it is very close to Mineola, so there were lots of people about when we were there. It really is a walk, not a hike.